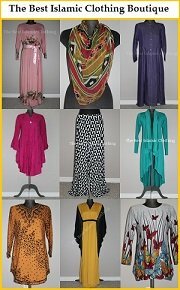 Find Burqini, Islamic swimsuit and modest swimsuit from The Best Islamic Clothing store for your swimming and beach activities. Opting to dress modestly following Islamic way does not mean that you are restricted to join any swimming activities indoor or outdoor. There are wide selections of modest swimwear in the market which are great for both indoor swimming and outdoor beach activities. Here you can find Islamic swimwear that usually comes in 3-4 pieces suit including matching hijab that you can buy at good price. Take a look at these modest and practical swimsuits and accessories including swimsuit cover and sarong offered at great prices! To view prices and to see lots more gorgeous swimsuits and beach and swimming accessories, just CLICK on the headlines under the swimsuit pictures.